This year, I had the honor of representing Kerckhaert and FPD at the track during the lead up to the Kentucky Derby. As always, it was a busy Derby week on the backside of Churchill Downs. For much of the week, I was able to spend time in the barn area, visiting with farriers and trainers. 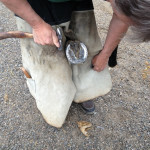 It was a pleasure to watch those talented farriers in action! 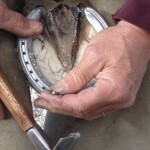 Congratulations to all of the farriers that shod horses running in this year’s Kentucky Derby and the Oaks. Special congratulations to Judd Fisher who shod the first place winner in the Derby – California Chrome. 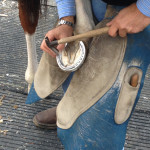 Spending time with farriers like Steve Norman, who shod Danza, third in the Derby and My Miss Sophia, second in the Oaks, is always exciting; watching him balance his shoeing schedule between scheduled shoeing and last minute adjustments requested by the trainer. 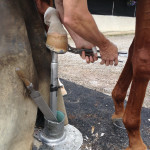 I was also fortunate to see other amazing farriers – Todd Boston, Mark Dewey, Frankie Guarneri, Pat Broadus, Chris Broadus, Gary Churchman and Zane Baze – up close and at work during this important racing week. 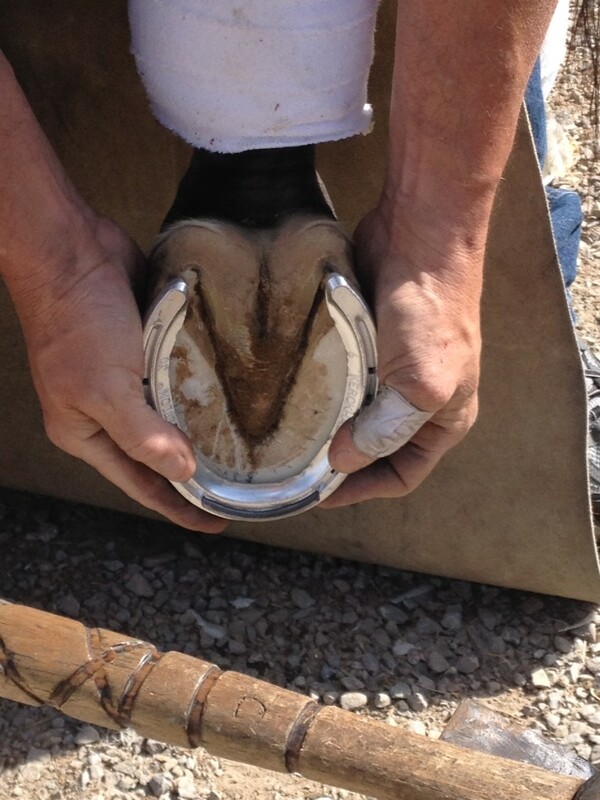 Jimmy Costello fitting “Wicked Strong” for a Kerckhaert Tradition Regular Toe (toe clipped) hind. Late in the week, the backside was buzzing when trainer Bob Baffert made the decision to scratch one of the derby favorites, Hoppertunity, because of a foot issue. 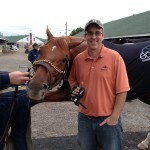 Word on the track is Hoppertunity had a bruised foot and will be fine. It was clear Baffert was putting the horse’s best interest first. No one likes to see a horse get scratched after all of the hard work and effort that goes into preparing for a race like the Kentucky Derby. Derby morning, while sunny and beautiful, was very busy as I watched farrier Jimmy Costello shoe the hind feet of fourth place Derby finisher, Wicked Strong, and Mark Dewey shoe Samraat, both with Kerckhaert Tradition Hind Toe Clipped. Samraat was the fifth place finisher in the Derby. 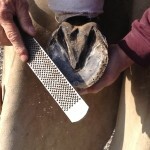 Kerckhaert Horseshoes continues to grow in popularity and has become the shoe of choice for many professional farriers and trainers in the racing industry. This year, Kerckhaert shoes were on the feet of at least 21 horses that ran in the Derby and Oaks, far exceeding any other brand! This was the 140th running of the Kentucky Derby with all of its glamour and tradition, but in my opinion nothing is more entertaining and interesting than watching the farriers at work. I was proud to be there representing Kerckhaert and FPD. Todd Boston nailing on a Kerckhaert Tradition Regular Toe Hind. Steve Norman levels and rasps the foot of “Boisterous.” Steve is using a Bellota Top Sharp rasp. Steve Norman fits this horse with a Kerckhaert Fast Break XT. I take a moment to pose with “Danza” – he even shares a grin! This entry was posted in Events, On the Road, People, Products and tagged 2014 Kentucky Derby, 2014 Kentucky Derby Farriers, derby, Farrier Products, farriers, FPD, horseshoes, kentucky, kentucky derby, kerckhaert, Kerckhaert Fast Break, Kerckhaert Legendary, Kerckhaert Race Plates, Kerckhaert Tradition, ky derby, shoeing. Bookmark the permalink.